It’s not the fragmentation of operating systems for mobile devices I want to talk about. It’s the fragmentation of information. In computer storage, fragmentation is a phenomenon in which storage space is used inefficiently, reducing capacity or performance and often both. The exact consequences of fragmentation depend on the specific system of storage allocation in use and the particular form of fragmentation. In many cases, fragmentation leads to storage space being “wasted”, and in that case the term also refers to the wasted space itself. For other systems (e.g. the FAT file system) the space used to store given data (e.g. files) is the same regardless of the degree of fragmentation (from none to extreme). There are three different but related forms of fragmentation: external fragmentation, internal fragmentation, and data fragmentation, which can be present in isolation or conjunction. Fragmentation is often accepted in return for improvements in speed, simplicity, or security. Solving life’s dilemma one app at a time. True, if you look at the 1m apps offered in the App Store. False, if you want to keep relevant data together for a more seamless access by using the UI of just one app. Every app is an island. During installation the installer creates an app specific directory. This directory constitutes the app’s primary view of the file system and represents the universe for that app and it contains everything the app can access directly. This also implies that information is distributed within the iOS filesystem one app at a time. With the installation of an app for specific purposes fragmentation starts and is continued with every installation of further apps. Contacts, notes, events, and links are typically managed by built-in apps or/and additional apps purchased at Apple’s App Store. To use many apps is followed by frequent switches between apps to look up the data you need. There are many different types of apps, e.g. web-based applications retrieving their data online from servers (e.g. Google+ for connecting to Google’s social network) or text editors keeping written text in the local folder of your device (e.g. ByWord a simple text editor). Tap Forms is a table-based app keeping all bits on your device. It allows access to hierarchically organized data. Opening the app displays topics and a Search-Field where you can enter a term. The app then displays records matching the term. Tapping on a record displays related information. a dictionary, a product description with a photo and a parts lists, a repository, or more detailed information about customers, visits, sold products, location of the main office and audio notes to a meeting which cannot be entered in Apple’s built-in app Contacts. The strong benefit of a table-based app is the synopsis of otherwise widely spread information using different content-related tables with an option to connect them. Tap Forms uses the term forms as a synonym for a table. If encryption is turned on data stored in iCloud is encrypted. Each time you tap the sync button in Tap Forms, it creates an encrypted file and uploads that to iCloud. Then, the other devices download that encrypted file and merge the changes with the local database. Data are encrypted on the device, during transfer to iCloud and on iCloud. To access data on iCloud your Apple ID, password, and the encryption key of Tap Forms is needed. So Tap Forms can also be used as a password keeper. If you created a form ‘Articles’ you can use the ‘Link to Form’ field to assign available accessories stored in a second form ‘Accessories’. You get this all and more from Tap Zapp Software Inc. (Canada) when buying Tap Forms for iOS or OSX. This goes for Brendan Duddridge, the developer of Tap Forms and founder of Tap Zapp Software Inc., Canada. The final outcome is an app 90% near to be perfect. What about the remaining 10%? Well, let’s give him an even break to further improve his app. 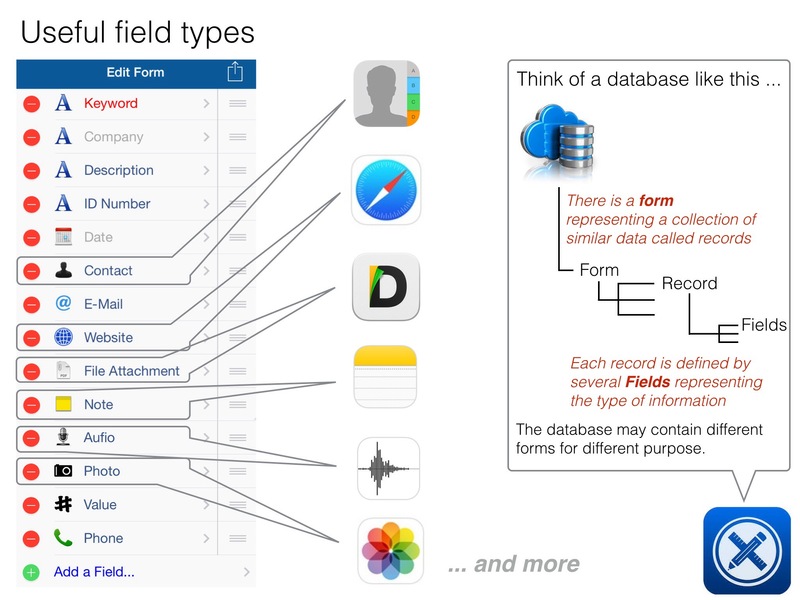 The extensive field list of Tap Forms shows the capabilities you have to create your personal data collections. If you never created a database before it’s worth to first think about what you need, then create the necessary fields, and finally start entering the data. Your requirements will grow up with the daily usage and your experiences. Don’t worry. You can modify your first design later by adding fields, deleting fields, or changing the order in which records are displayed. While redesigning, the dialogs to change content and appearance do not overlap with what you change and all your changes are immediately shown in the data entry area. 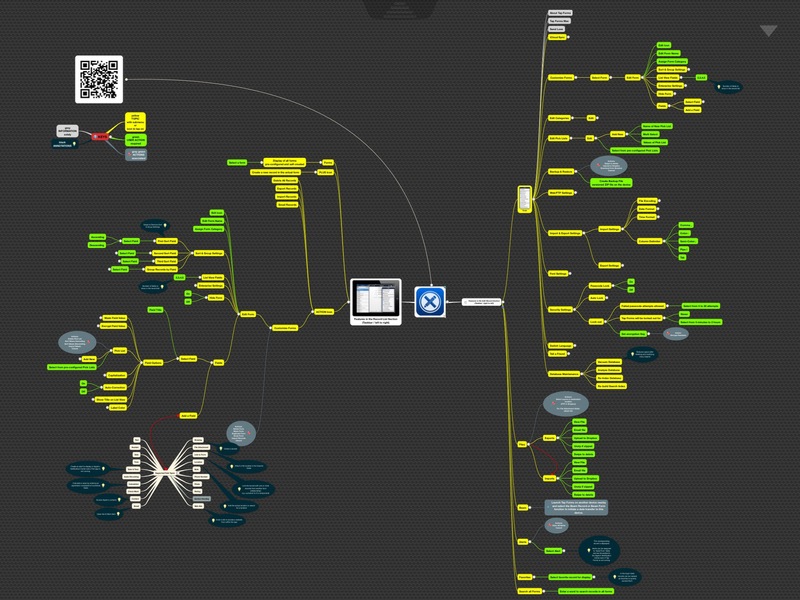 Here is a mind map visualizing all features of Tap Forms. It’s not only me rating Tap Forms with 5 stars. Mac Format Magazine assessed the app as the winner of a database shootout and one of the competitors was FileMaker by FileMaker Inc., a subsidiary of Apple. 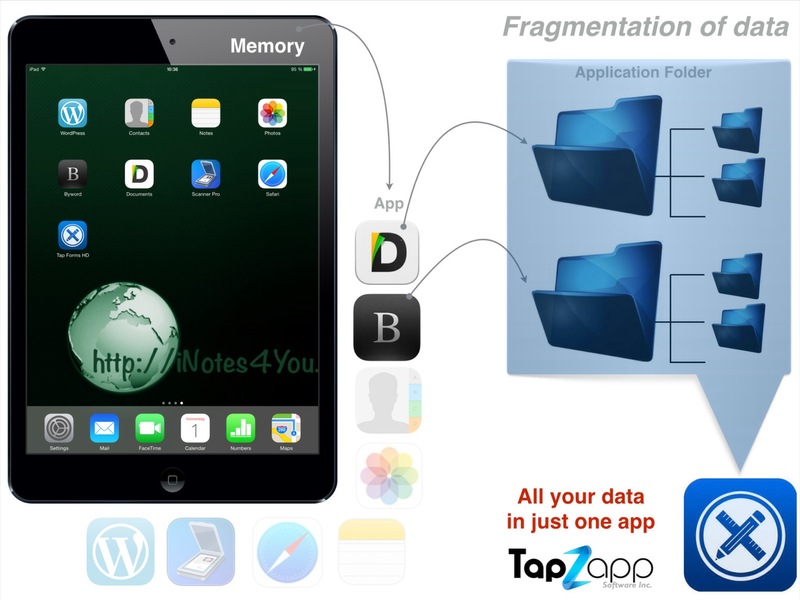 A database app is a perfect approach to stop fragmentation. Tap Forms supports you with a clean an tidy user interface, stable data management, and syncing with all your devices. You will need the iOS Multitasking view less frequently because there is an app solving the dilemma with widely spread information. Whether you use it as a personal database or for your business, the data go with you, always updated.